AN ORDINANCE TO REGULATE THE DIVISION OF EXISTING PARCELS OF LAND PURSUANT TO ACT 288 OF THE PUBLIC ACTS OF 1967, AS AMENDED, AND ACT 246 OF THE PUBLIC ACTS OF 1945, AS AMENDED, TO PRESCRIBE PROCEDURES THEREFOR, AND TO PROVIDE PENALTIES FOR VIOLATIONS OF THE ORDINANCE. This Ordinance shall be known as the Hayes Township Parcel Division Ordinance. The purpose of this Ordinance is to carry out the provisions of the Land Division Act (Act 288 of the Public Acts of 1967, as amended, formerly known as the Subdivision Control Act), to prevent the creation of lots and parcels that do not comply with applicable Hayes Township ordinances, to minimize potential boundary disputes, to maintain the orderly development of the township, and to otherwise protect the public health, safety and general welfare of the residents and the present and future property owners of Hayes Township. This shall be accomplished by regulating the division of existing lots and parcels and property transfers between two (2) or more adjacent lots or parcels. It is further the purpose of this Ordinance to prescribe the procedures for the submission and review of proposed lot and parcel divisions and property transfers, to authorize fees for the review of applications submitted under this Ordinance, and to provide penalties for violations of this Ordinance. (1). Has an area where a driveway provides vehicular access to an existing road or street and meets all applicable location standards of the state transportation department or county road commission under Act 200 of the Public Acts of 1969, as amended, or has an area where a driveway can provide vehicular access to an existing road or street and can meet all such applicable location standards. (2). Is served by an existing easement that provides vehicular access to an existing road or street and meets all applicable location standards of the state transportation department or county road commission under Act 200 of the Public Acts of 1969, as amended, or can be served by a proposed easement that will provide vehicular access to an existing road or street and that will meet all such applicable location standards. (b). “Applicant” means an owner of a lot or parcel of land, or his or her designee. (c). “Convey” means a transfer of an ownership interest in real property. (1). Agricultural use involving the production of plants and animals useful to humans, including forages and sod crops; grains, feed crops, and field crops; dairy and dairy products; poultry and poultry products; livestock, including breeding and grazing of cattle, swine and similar animals; berries; herbs; flowers; seeds; grasses; nursery stock; fruits; vegetables; Christmas trees; and other similar uses and activities. (2). Forestry use involving the planting, management, or harvesting of timber. (e). “Divide” or “Division” means the partitioning or splitting of a lot, parcel or tract of land by the owner for the purpose of sale, lease for more than one (1) year, building development, or the creation of separate lots, parcels or tracts of land on the tax roll that results in one (1) or more lots or parcels of less than forty (40) acres or the equivalent. “Divide” or “Division” does not include a property transfer between two (2) or more adjacent lots or parcels, if the property taken from one (1) lot or parcel is added to an adjacent lot or parcel; and any resulting lot or parcel shall not be considered a building site unless the lot or parcel conforms to the requirement of the Land Division Act, being Act No. 288 of the Public Acts of 1967, as amended, the Hayes Township Zoning Ordinance, as amended, and this Ordinance. (f). “Exempt split” means the partitioning or splitting of a lot, parcel or tract of land by the owner that does not result in one (1) or more lots or parcels of less than forty (40) acres or the equivalent. For a property transfer between two (2) or more adjacent lots or parcels, if the property taken from one (1) lot or parcel is added to an adjacent lot or parcel, any resulting lot or parcel shall not be considered a building site unless the lot or parcel conforms to the requirement of the Land Division Act, being Act No. 288 of the Public Acts of 1967, as amended, the Hayes Township Zoning Ordinance, as amended, and this Ordinance. (g). “Forty (40) acres or the equivalent” means forty (40) acres, a quarter-quarter section containing not less than thirty (30) acres, or a government lot containing not less than thirty (30) acres. (h). “Land” means all land areas occupied by real property, except the submerged bottomlands of inland lakes, rivers, and streams. (i). “Lot” means a measured portion of a parcel or tract of land, which is described and fixed in a recorded plat. A lot’s legal description is referred to as Lot ( # ) of the Plat of ( Name of Plat ). (j). “Metes and bounds” means a description of land by boundary lines with their terminal points and angles. (k). “Owner” means a person holding any legal, equitable, option or contract interest in a lot or parcel of land. (l). “Parcel” means a continuous area or acreage of land of any size, shape or nature, which is described by metes and bounds. (m). “Parent parcel” means first a tract of land lawfully in existence on March 31, 1997, if one exists in connection with a proposed division, or, if one does not exist, a parcel lawfully in existence on March 31, 1997. (n). “Person” means an individual, firm, corporation, association, partnership, estate, trust, limited liability company, or other legal entity. (o). “Planning Commission” means the Hayes Township Planning Commission. (p). “Plat” or “Recorded plat” means a map or chart of a subdivision of land created pursuant to the Land Division Act of 1967, being Act 288 of the Public Acts of 1967, as amended, or predecessor statutes to this act. (q). “Property transfer” means a transfer of property between two (2) or more adjacent lots or parcels, if the property taken from one (1) lot or parcel is added to an adjacent lot or parcel and if all resulting lots or parcels conform to the requirements of the Land Division Act, being Act 288 of the Public Acts of 1967, as amended, the Hayes Township Zoning Ordinance, as amended, and this Ordinance. If the property transferred does not independently conform to the requirements of the Land Division Act, being Act 288 of the Public Acts of 1967, as amended, the Hayes Township Zoning Ordinance, as amended, and this Ordinance, then it shall not be considered a development site, but may only be used in conjunction with the lot or parcel to which it was transferred. (r). “Tract of land” means two (2) or more parcels that share a common property line and are under the same ownership. (s). “Zoning Administrator” means the Hayes Township Zoning Administrator. (t). “Zoning Board of Appeals” means the Hayes Township Zoning Board of Appeals. Section 4. Approval of Land Divisions or Property Transfers Required; Establishment of Exempt Splits. (a). The owner of a lot, parcel, or tract of land shall not divide or effect a property transfer involving, or cause any person to divide or effect a property transfer involving, that lot, parcel, or tract of land except as provided in this Ordinance, unless the division or property transfer is approved as part of a subdivision plat at the time of plat approval under the Land Division Act of 1967, being Act 288 of the Public Acts of 1967, as amended, the division or property transfer is part of a condominium project developed under the Condominium Act, being Act 59 of the Public Acts of 1978, as amended, or the division or property transfer is done pursuant to an order of a court of competent jurisdiction. (b). The owner of a lot, parcel, or tract of land claiming an exempt split as defined in Section 3(f) of this Ordinance shall submit to the Zoning Administrator either a survey map of the land claimed to be an exempt split prepared pursuant to the survey map requirements of Act 132 of the Public Acts of 1970, as amended, certified by a land surveyor licensed by the State of Michigan, or other clear evidence documenting that the proposed exempt split of a parcel or tract of land will not result in one (1) or more parcels of less than forty (40) acres or the equivalent. In addition, the owner of a lot, parcel, or tract of land claiming an exempt split shall submit to the Zoning Administrator a permit or other documentation from the state transportation department or the Charlevoix County Road Commission documenting that each new lot, parcel, or tract of land resulting from the proposed exempt split has or can have a driveway or easement that provides vehicular access to an existing road or street and meets all applicable location standards of the state transportation department or the Charlevoix County Road Commission under Act 200 of the Public Acts of 1969, as amended. If the Zoning Administrator finds that the proposed division is an exempt split and that each new lot, parcel, or tract of land that will result from the division is accessible, then no further action under this Ordinance shall be required. If the Zoning Administrator finds that the proposed division is either not an exempt split or that each new lot, parcel, or tract of land that will result from the division is not accessible, then he or she shall give the owner written reasons for his or her decision. In that event the owner shall be required to proceed under Section 5 of this Ordinance to obtain approval of the proposed division. If the owner disagrees with the Zoning Administrator’s decision, the owner can submit revised information to the Zoning Administrator or appeal the Zoning Administrator’s decision to the Zoning Board of Appeals pursuant to Section 8 of this Ordinance. (c). In addition, an exempt split or other partitioning or splitting of a parcel or tract of land that only results in parcels of twenty (20) acres or more in size is not subject to approval under this Ordinance if the parcel or tract of land being partitioned or split is not accessible and was in existence on March 31, 1997 or resulted from an exempt split or a partitioning or splitting under Section 109b of the Land Division Act, as amended. Section 5. Procedure for Division or Property Transfer. (1). Proof of ownership of the lot, parcel, or tract of land to be divided, or of the lots or parcels involved in a property transfer. (2). The names and addresses of all persons having an interest in the lot, parcel, or tract of land to be divided, or of the lots or parcels involved in a property transfer and a statement of the type of interest each holds. (3). The history of the prior divisions of the parent parcel from which the Applicant’s parcel or tract of land came and proof that the Applicant holds the right to divide the parcel or tract of land proposed for division. (4). A survey map of the land proposed to be divided or the land involved in the property transfer prepared pursuant to the survey map requirements of Act 132 of the Public Acts of 1970, as amended, certified by a land surveyor licensed by the State of Michigan and depicting the dimensions of the lot, parcel, or tract of land to be divided, or the lots or parcels involved in a property transfer, the dimensions of the lots, parcels, or tracts of land that will result from the division or property transfer, the location of all current easements on the lot, parcel, or tract of land to be divided, or on the lots or parcels involved in a property transfer, and the location of all proposed easements on the lots, parcels or tracts of land that will result from the division or property transfer. The easements required by this subsection shall include both utility easements and ingress/egress easements. The survey shall also depict all buildings and structures on the lot, parcel, or tract of land to be divided, or on the lots or parcels involved in a property transfer and the distances between these buildings and structures and the original property lines of the lot, parcel, or tract of land to be divided, or the lots or parcels involved in a property transfer and shall depict the distances between these buildings and structures and the property lines of the lots, parcels, or tracts of land that will result from the division or property transfer. (5). A map showing the location of the lot, parcel, or tract of land to be divided, or the lots or parcels involved in a property transfer within the township. (6). Legal descriptions, certified by a registered land surveyor licensed by the State of Michigan, of the lots, parcels, or tracts of land that will result from the division or property transfer. (8). If the lot, parcel, or tract of land that will result from the division or property transfer will be a development site, then the Applicant shall submit a permit or other documentation from the state transportation department or the Charlevoix County Road Commission that each such resulting lot, parcel, or tract of land has or can have a driveway or easement that provides vehicular access to an existing road or street and meets all applicable location standards of the state transportation department or the Charlevoix County Road Commission under Act 200 of the Public Acts of 1969, as amended. In addition, the Applicant shall submit evidence establishing adequate easements for public utilities from each such resulting lot, parcel, or tract of land to existing public utility facilities. (9). A brief statement as to the purpose of the proposed division or property transfer and whether the lots, parcels or tracts of land that will result from the division or property transfer will be used for residential (single family, multi family, etc. ), commercial, or manufacturing purposes. (10). Such other documentation that the Zoning Administrator may require relating to the application to divide a parent parcel. (b). The application shall be accompanied by an application fee as established and set forth in a township fee schedule. This fee schedule shall also establish “after the fact” fees that must be paid when an otherwise lawful division or property transfer occurs but without first complying with the procedural requirements of this Ordinance. This “after the fact” fee is not intended to be a penalty, but shall consist of the normal application fee plus an amount equal to the legal and administrative costs incurred by the township as the result of the Applicant’s failure to initially comply with the requirements of this Ordinance. (c). After receiving the information required in subsection (a) above, the Zoning Administrator shall, within forty-five (45) days, decide whether to approve the proposed division or property transfer. If the Applicant fails to provide all the information required by this Ordinance, then the application shall be deemed incomplete and may be denied on that basis. The Zoning Administrator’s decision to approve the division or property transfer shall be made pursuant to the standards contained in Section 6 of this Ordinance. The Zoning Administrator may grant conditional approval of an application, subject to the Applicant obtaining any necessary variances from the Zoning Board of Appeals pursuant to Section 7 of this Ordinance. If the Zoning Administrator fails to grant approval of a proposed division or property transfer, written reasons for his or her decision shall be given to the Applicant. The Applicant shall then have the option of resubmitting information for approval to the Zoning Administrator or appealing the Zoning Administrator’s decision to the Zoning Board of Appeals pursuant to Section 8 of this Ordinance. (d). If the Zoning Administrator approves a proposed division or property transfer, then the Zoning Administrator shall send a letter indicating such approval to the Applicant with copies to the Hayes Township Supervisor, the Hayes Township Treasurer, the Hayes Township Assessor, and the Charlevoix County Register of Deeds. This letter shall contain the following statement: “Hayes Township, its officers and employees are not liable if a building permit is not issued pursuant to Section 109a of the Land Division Act, as amended, for a parcel less than one (1) acre in size that resulted from an approved division under the Hayes Township Parcel Division Ordinance.” A copy of this letter shall be retained by the Zoning Administrator in his or her official records. (e). Because zoning requirements may change over time, any approval of an application for a division or property transfer by the Zoning Administrator under Section 5(c) above shall expire and a new approval required after ninety (90) days from the date of the approval, unless the Applicant records in the Charlevoix County Register of Deeds Office an instrument(s) of conveyance documenting the division or property transfer and files a copy of that recorded instrument(s) with the Zoning Administrator. Section 6. Standards for Approval of Parcel Divisions or Property Transfers. (a). The proposed division or property transfer shall comply with all requirements of the Land Division Act of 1967, being Act 288 of the Public Acts of 1967, as amended. (b). The lots, parcels, or tracts of land that will result from the division or property transfer shall comply with all requirements of the Hayes Township Zoning Ordinance, as amended, including but not limited to the requirements relating to area and width for the newly created lots, parcels, or tracts of land, the requirements relating to lake and/or road frontages, and the requirements relating to setbacks if the newly created lots, parcels, or tracts of land have buildings or structures on them. The addition of land to an already lawful nonconforming lot or parcel is permitted without a zoning variance, provided that the lot or parcel from which the land is taken will not become a nonconforming lot or parcel or, if already nonconforming, will not become more nonconforming. (c). Each lot, parcel, or tract of land that will result from the division or property transfer shall have an adequate and accurate legal description certified by a land surveyor licensed by the State of Michigan, shall be serviced by a public utility easement, and shall be accessible. (d). Each new lot, parcel, or tract of land that will result from the division, including those lots, parcels, and tracts of land greater than ten (10) acres, shall have a depth of not more than four (4) times its width as measured under the requirements of the Hayes Township Zoning Ordinance. This standard shall not apply to a property transfer. (e). If a lot, parcel, or tract of land that will result from the division or property transfer will be a development site, then each such resulting lot, parcel, or tract of land shall have adequate easements for public utilities from each such resulting lot, parcel, or tract of land to existing public utility facilities. (f). If the land proposed to be transferred between two (2) or more adjacent lots or parcels does not independently conform to the requirements of the Land Division Act, being Act 288 of the Public Acts of 1967, as amended, the Hayes Township Zoning Ordinance, as amended, and this Ordinance, then the land proposed to be transferred shall not thereafter be independently considered a development site, but may only be used in conjunction with an adjoining lot(s), parcel(s), or tract(s) of land. (g). Each lot, parcel, or tract of land that will result from the division or property transfer shall be accessible. (h). The owner of the parcel or tract of land shall possess the right to divide the parcel or tract of land. This standard shall not apply to a property transfer. (i). The property lines of the lots, parcels, or tracts of land that will result from the division or property transfer shall be consistent and in harmony with the property lines of the lot, parcel, or tract of land to be divided, or the lots or parcels involved in a property transfer, and/or the property lines of adjacent lots, parcels, or tracts of land. Section 7. Land Configuration Variances. (a). 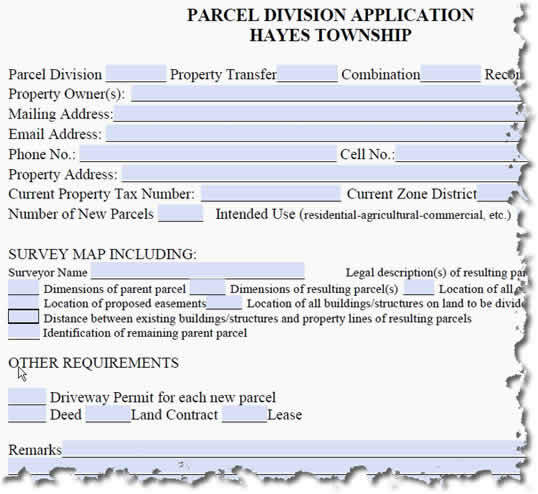 If a lot, parcel, or tract of land that will result from a division or property transfer does not meet the requirements of the Hayes Township Zoning Ordinance as specified in Section 6(b) of this Ordinance, then the Applicant may seek a variance from those zoning requirements from the Zoning Board of Appeals pursuant to the procedures of the Hayes Township Zoning Ordinance. (b). If a lot, parcel, or tract of land that will result from a division does not meet the depth to width requirements of Section 6(d) of this Ordinance, then the Applicant may seek a variance from those requirements from the Zoning Board of Appeals pursuant to the procedures of this section. (1). Exceptional or extraordinary circumstances or conditions exist on the parent parcel, including exceptional topographic or physical conditions, that do not generally apply to other lots, parcels, or tracts of land in the township. (2). The exceptional or extraordinary circumstances or conditions existing on the parent parcel are not the result of any act or omission by the Applicant or his or her predecessors in title. (3). The granting of the variance shall not be injurious or otherwise detrimental to adjoining lots, parcels, or tracts of land or to the general health, safety, and general welfare of the township. (4). The resulting lots, parcels, or tracts of land with the variance granted shall be compatible with surrounding lots, parcels, or tracts of land. (5). The variance granted shall be the minimum variance that will make possible the reasonable use of the parent parcel. (d). The Zoning Board of Appeals shall follow the procedures of the Hayes Township Zoning Ordinance relating to variances when deciding whether to grant a variance under this section. (e). In granting any variance under this Ordinance, the Zoning Board of Appeals may prescribe appropriate conditions and safeguards in order to ensure that the lot, parcel, or tract of land that will result from the division or property transfer complies with the variance granted under this Ordinance. Violations of such conditions and safeguards shall be deemed a violation of this Ordinance, punishable under Section 9 of this Ordinance. Section 8. Appeals to the Zoning Board of Appeals. Any person aggrieved by a decision of the Zoning Administrator may appeal that decision to the Zoning Board of Appeals following the procedures of the Hayes Township Zoning Ordinance, as amended, for appeals to the Zoning Board of Appeals. Any such appeal shall be filed within thirty (30) days from the date of the decision from which the appeal is taken. During the appeal, the Zoning Board of Appeals shall conduct a de novo hearing of the matter and to that end shall have all the powers of the Zoning Administrator. In rendering its decision, the Zoning Board of Appeals shall receive and consider evidence and data relevant to the case and shall issue its decision in writing within thirty (30) days after receiving all evidence and data in the case. The decision of the Zoning Board of Appeals shall then be sent promptly to the Applicant, to the person who filed the appeal (if different than the Applicant), and to the Zoning Administrator and Township Assessor. Section 9. Violations and Penalties. this Section shall not prevent civil proceedings for abatement or termination of the prohibited activity. The Zoning Administrator is hereby designated as the authorized township official to issue municipal civil infraction citations directing alleged violators of this Ordinance to appear in court. Section 12. Separate Court Action.